If you are an existing NowSMS customer without a current NowSMS Upgrade Agreement, you can continue to use existing, purchased and installed NowSMS product. You will just not be able to install upgraded versions of the NowSMS software. If NowSMS detects an existing installation with a serial number for an older version of the product, without a current NowSMS Upgrade Agreement, it will display a warning message. If your upgrade agreement is current, no message will be displayed. 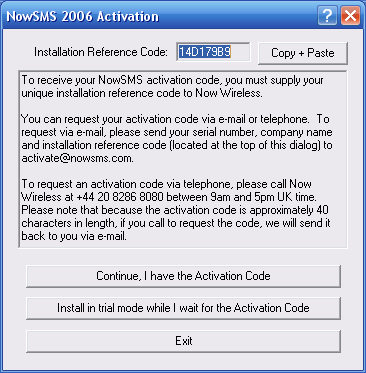 Please note that if you purchased a previous version of NowSMS within 12 months prior to the release of NowSMS 2010, your existing NowSMS activation code will allow you to install NowSMS 2010. Customers using earlier versions of NowSMS may need to purchase an upgrade, or extend their existing maintenance agreement in order to install NowSMS 2010. When upgrading, you will need to obtain an Activation Code from the publisher of NowSMS, following the instructions below. 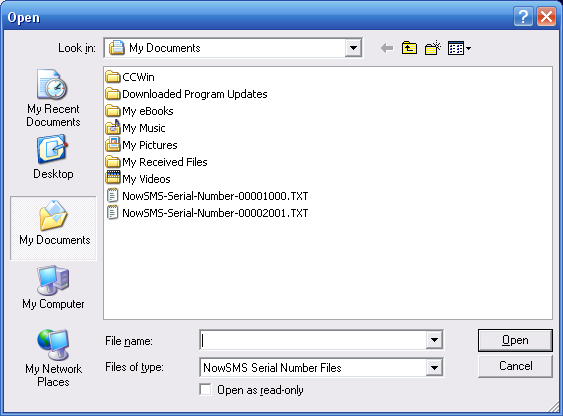 Selecting No or Cancel will abort the installation, and display contact information for the publisher of NowSMS. Selecting Yes will display information on how to renew your NowSMS Upgrade Agreement and/or apply the required new activation code. Selecting Yes will prompt for the Serial Number and Activation Code. 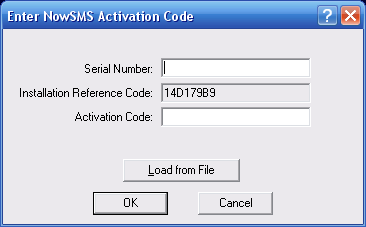 The Activation Code is approximately 40 characters in length, and can be either entered manually, or more commonly, the publisher of the NowSMS software will send you a text file attachment in an e-mail message, which can be easily selected via the Load from File button. To receive your NowSMS activation code, you must supply your unique Installation Reference Code to Now Mobile. You can request your activation code via e-mail or telephone. To request via e-mail, please send your serial number, company name and installation reference code to activate@nowsms.com, or to your NowSMS sales representative. To make it easier to copy and paste the code, you can use the Copy + Paste button to copy it into an e-mail or other document. It is possible to install the product in trial mode while awaiting delivery of the Activation Code. In this mode, the software will function for 60 days. Once you have received the activation code, it can be easily applied by following the instructions under the heading New Customer: Applying a Purchased License to an existing Trial Installation. You can also choose to install the product in trial mode to evaluate it. If, after 60 days, you have not purchased an updated license, and you wish to continue using NowSMS, this is only possible if you restore the older version of the NowSMS software. Click here to return to Installing NowSMS.